When converting an unfinished section of the attic in their 1890s Shingle-style Victorian just outside of Boston into a master bathroom, Ingrid and John Coates had two goals. First, they wanted to usher plenty of light into the third-floor space. They also wanted to add a dash of whimsy for their children, whose playroom is adjacent to the bathroom. And they wanted to accomplish both things while remaining true to the style of the home. Because the footprint of the house couldn&apos;t be expanded, restoration contractor Charlie Allen built in a gable dormer to drench the tub room with natural light. He also worked with the unusual shape of the roofline to create a trapezoidal transom above the door between the tub and shower that further opens up the space. 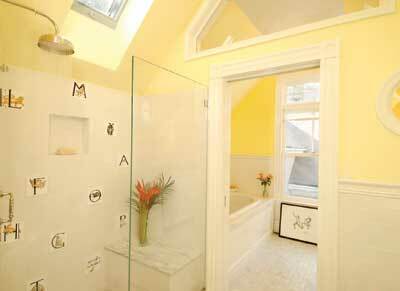 A skylight over the shower and a small porthole window near the sink help the room feel even sunnier. The childlike fancy the Coates sought was achieved by a shower stall lined with alphabet tiles bearing images from Aesop&apos;s fables. "They&apos;re fun, but they&apos;re also appropriate to the era of the house," Charlie notes. In every other regard, though, the bathroom sticks to tradition, with a console sink, black-and-white mosaic Carrara marble tile, and traditional molding and wainscoting. All of the molding was custom-cut by a local lumberyard to match the woodwork in the rest of the home. "Bathrooms and kitchens present so many modern amenities that they can be jarring to the feel of an old house," Charlie says. "One way to soften that is to bring in traditional moldings." To solve the storage-space conundrum that&apos;s common in old-house bathrooms, Charlie built in a linen closet next to the shower, and installed a vanity with extra cabinet space in the tub room. Both storage solutions have unassuming profiles that blend well in the traditional space. 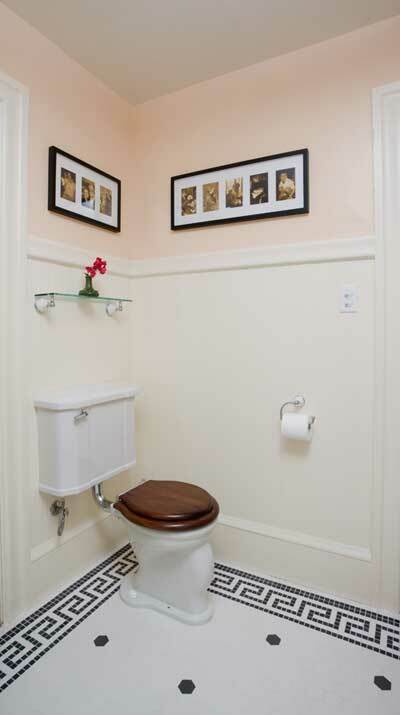 "The bathroom is elegant," says Charlie, "but with a little whimsy." 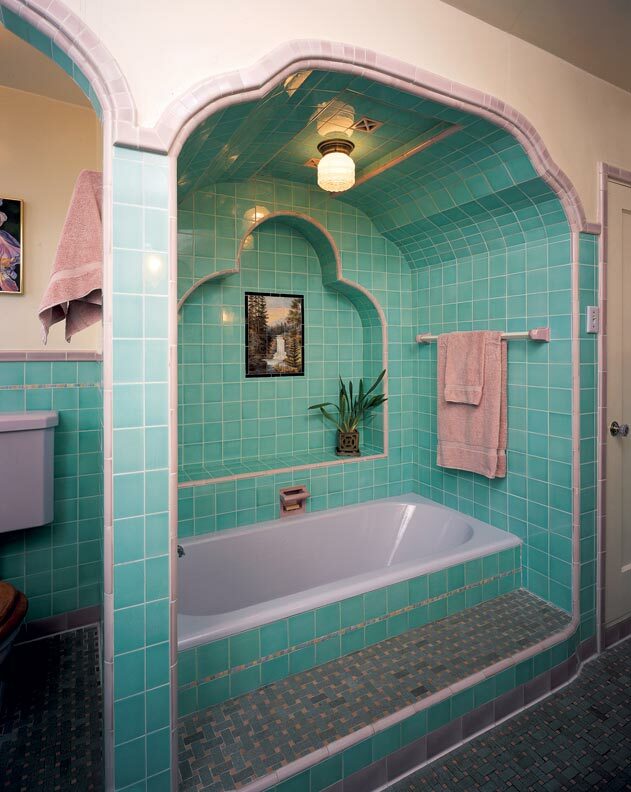 The bathroom in Becky Waring&apos;s 1906 Berkeley, California, brown-shingle cottage—a house some attribute to Julia Morgan—was dingy, with linoleum on the floor and unappealing 1970s white tile set in stained grout. 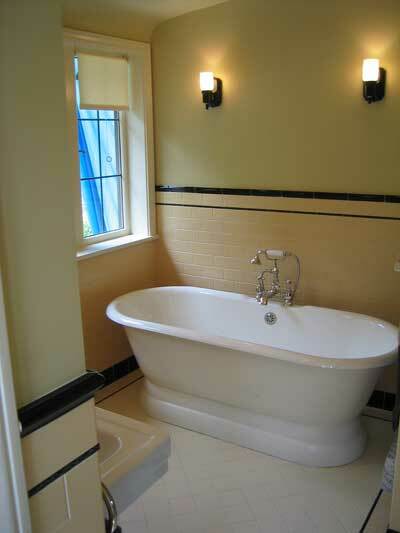 "I wanted the bath to look as nice as the rest of the house, while maintaining historical authenticity," Becky explains. So she researched period bathrooms everywhere she could, and did extensive product scouting. "It didn&apos;t matter if the fixtures were cheap or pricey," she says. "They had to look right." She also found Riley Doty, a master tilesetter with the San Francisco-based restoration group Artistic License, to help guide her. "Becky chose to take a strictly historical approach," says Riley, "using only elements that would have been found in a 1906 bath." So he suggested a sanitary white-tiled bathroom, featuring square-edged subway tiles and tight grout lines. "Because grout wasn&apos;t impervious to moisture like tiles, at the turn of the century, the grout lines were designed to be as small as possible," Riley explains. Becky knew she wanted hex tiles on the floor, so Riley suggested a simple inset of 2" hex tiles, dotted in black, surrounded by a Greek key border. Installing borders can pose problems in old houses, where the floors are seldom square, so Riley placed the border 2" from the wall. "That way, any tapering or bulging lines get absorbed into a neutral field, and the border remains perfect." 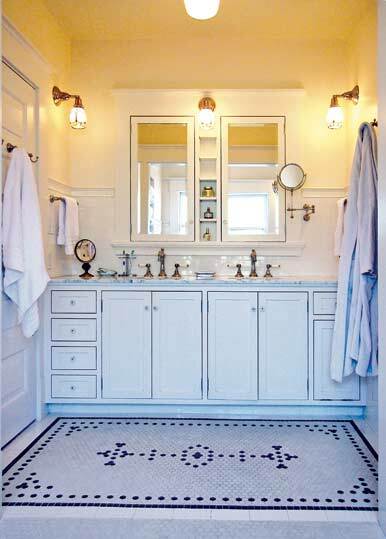 (Check out our article on tile patterns for floors). "Riley did a beautiful job," says Becky. "The bath now works aesthetically and functionally, and we honored the house&apos;s architectural heritage by keeping the beadboard and period fixtures, and using reproduction tile and hardware." 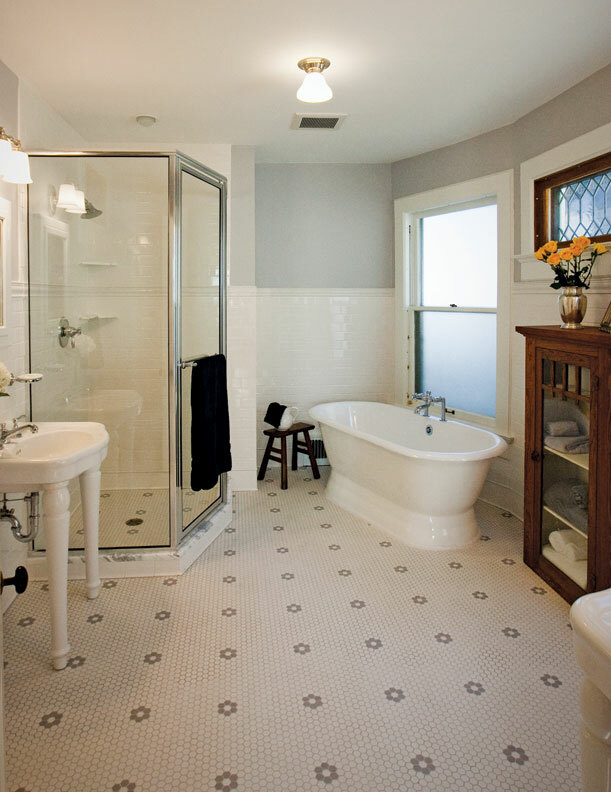 When Tal and Irene Saraf decided to update the master bathroom in their 1931 Tudor Revival house in Seattle, they were looking to add a little room—and some modern amenities like double sinks. "Our vision was to create a bath that seemed appropriate to the period of the house," explains Irene. "We wanted to add a little space, but still make the room feel like it could be original." 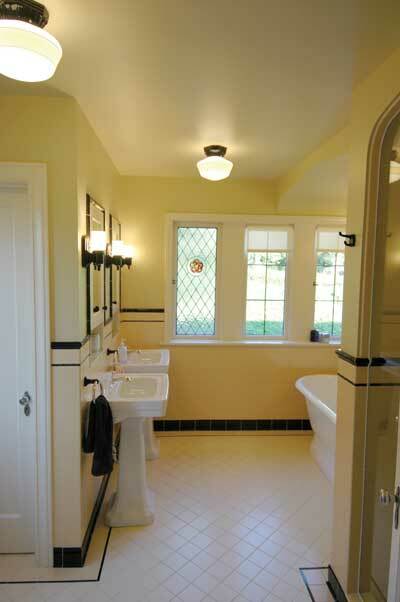 The Art Deco flavor of two other original bathrooms in the house, which have pink and black tile, provided the design inspiration. To capture the feel of this era, they worked with local architectural designer Clint Miller. "The tile was key to making the room work," says Clint. "On the walls, we wrapped the tile border around the medicine cabinets, instead of having it die where the two intersect—it&apos;s a treatment I had seen in several higher-end old houses, and it adds a real vintage feel." Clint, who calls himself "a longtime observer and appreciator of old houses," designed a basic subway tile configuration for the walls, but dressed them up by capping them off in black and adding a pencil-border detail. The pale yellow color was Irene&apos;s idea. 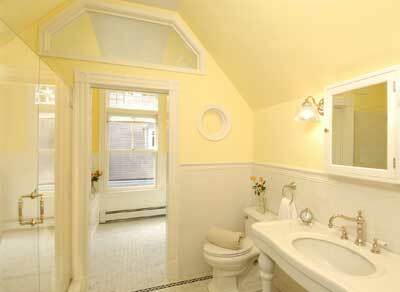 "I grew up in a late-1920s house with a yellow tile bathroom, and I&apos;ve always been drawn to that color," she says. On the floors, Clint designed a diagonally patterned field, which is framed by both a pencil border and a darker 4x4 tile laid straight. The finishing touch is black base tile, which makes the floor appear to be dressed for a ball and seals the Deco feel. "We were really happy to collaborate with someone who could help make the bathroom look like it&apos;s original to the house," says Irene. "It&apos;s lovely to look at and it&apos;s very functional as well—it makes me happy every day." 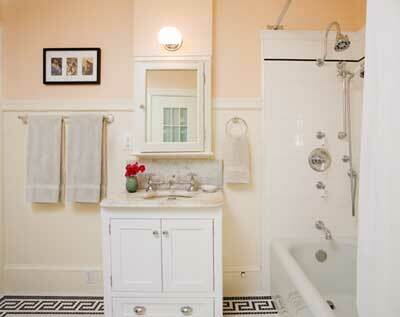 Learn how to design a small bathroom with these tips.